A true paradise for those who like sport, Alghero offers everything from excellent fishing, swimming and diving to world-class windsurfing, sailing, trekking, horse-riding and many other outdoor activities. It is also an untainted oasis for underwater photography and archaeology. Moreover, the surrounding area plays host to a plethora of pre-historic sites, nuraghi (ancient conical-shaped stone towers) and domus de janas or “fairy houses” – 5,000-year-old chamber tombs. 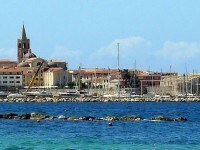 Alghero also has plenty for culture-vultures to savour, thanks to its Catalan-Gothic churches, fortified walls, towers and Aragonese palazzos. Tradition remains strong here, and is expressed through sacred rituals, time-honoured customs and the working of coral and filigree. The Catalan-influenced dialect of the welcoming, friendly locals is fascinating. The centre of the town provides the stage for numerous events, shows and popular festivals, and also includes a multitude of excellent bars and restaurants. Entertainment and fun are to be found everywhere around these parts.